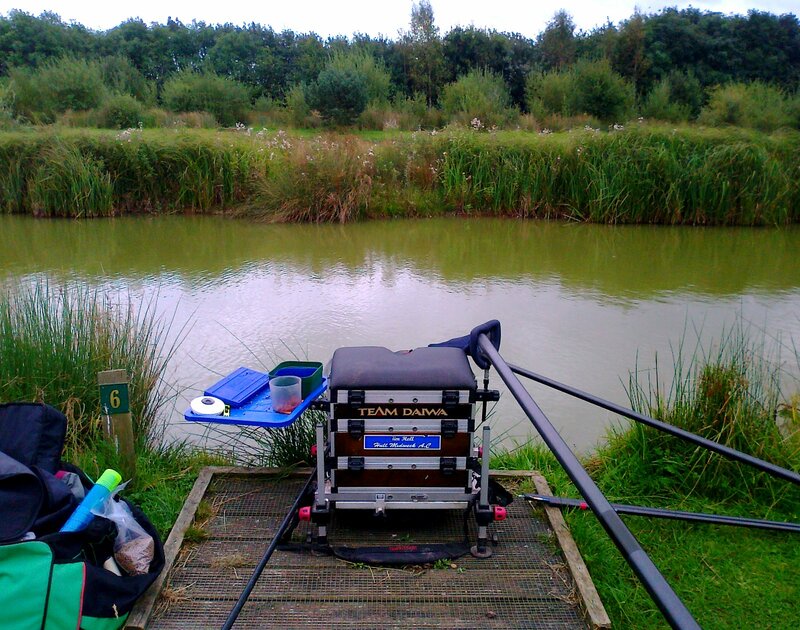 Monday 10th September saw me at Lake View Fishery Leicestershire, for a practise run for the Fire Service National teams match the next day. We arrived at 11am, after a 2 hour drive from Hull. We parked right next to the café and popped in for a quick brew, got our pellets and a quick low down on how it’s fishing! We had a walk round to suss out a good fishing spot, eventually deciding on the Stream Pond. I sat on peg 6, which gave me an island reach of 12m, so quite comfortable! I decided to start close to the island in 12’’ water, feeding softened micros using a ‘kinder pot’, and a Bait Tech 4mm expander on the hook! Things started off well with a fish every drop in. This lasted for some 30 mins, before bites started to slow enough to warrant a change in tactics. A worm on the hook and I’m in again resulting in another good run of fish! Happy with this set up, I then decided to fish the shallows, which I had been feeding by hand for the past ½ hour, at 2 & 2 distances. It started off really well, again a fish every cast. I concluded that the best way to feed was to use about 10 pellets, then slap the rig directly onto the ‘fed’ area. This resulted in a confident bite on most occasions, so overall I was more than happy with the approach we needed for match day! And so on to the B&B for shower, tea, & a few beers. 20 teams had found their way to the fishery, there was a heavy downpour the night before and the conditions were cold and windy. 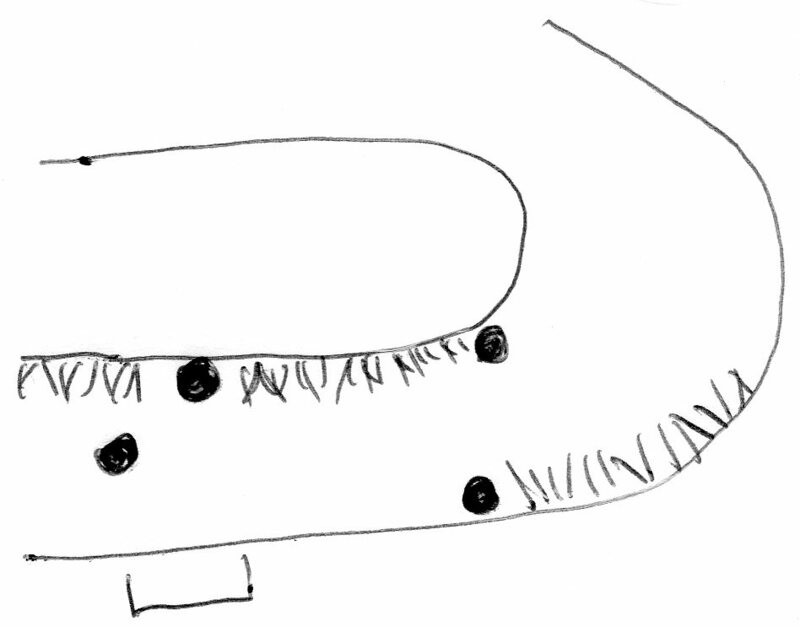 As teams captain I had the responsibility for drawing our pegs for the match, I drew peg 12 on Marina Lake. This was an end peg out of the wind, which was a wee bit chilly to say the least! The only drawback was that it was unfortunately blowing to the other end of the lake!!! 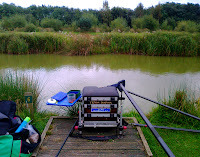 I set up the pole to fish into a cut out in the reeds at the island, which was 11.5m. I utilized the rig I had used yesterday, but replacing the hook length keeping the rig bang on the same depth as previous; perfect! I began with the 11.5m rig to the island fishing a 4mm Bait Tech pellet, feeding micros through a kinder pot. A steady run of fish from the off was a good start, they were a little on the small side, but it was fish in the net! But as repeated in the practice run things started to slow up, so again a change to the worm, which this time - never worked, gutted!!! WHEN THE BITES SEIZE TO A HALT! 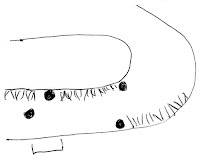 I decided to rest this area and try the 13m line; I also started to feed the shallow line by hand. So with the 13m line been deeper I again fed micros, but this time I squashed them into the kinder pot so that they would fall in a clump, getting it to the bottom quicker while lowering a 4mm pellet on top. A bite almost instantly, and a slightly bigger stamp of fish, had I finally sussed it? The answer was no, I never had another bite on that line! Shallow rig time; and guess what?... Not one bite!, So moving back to the 11.5m line, I started to pick up a few fish, but it was slow going. During this time I had noticed few fish cruising in the corner to my left, so I decided to start firing a few 4mm pellets every 2 mins. After 30 mins of feeding I decided to give it a go. Using the shallow rig I shipped the pole 13m into the corner and slapped the rig over, the float buries straight away, and elastic streams out the end of my pole! The fish turned out to be a mirror carp approx 3lb, ‘brilliant!’ Before shipping the pole back out I catapult a dozen pellets, then the same thing happens, but this time a hook pulls at the net, bugger! I spent the rest of the match approx 1 ½ hours on the line picking up better size F1 carp and the odd mirror. When the whistle went for all out I had a fish on....by a cats whisker, into the net it went! The scales arrived and two weights later I had 44lb 6oz, giving me 2nd place on the lake and 2 points. The team finished in 4th place by 1 point.